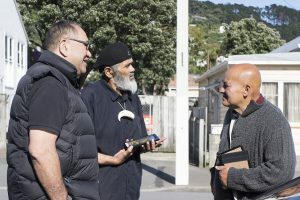 Whānau with photos of their loved ones meet outside the whare. A Raa Kawemate (a day to remember those who have passed on) was held at Te Kāinga, last year on Saturday 3 December. Over 100 people attended. Te Kāinga is a Catholic Māori community in Wellington. Twenty whānau brought framed photos of their loved ones who had passed away, to hang on the walls of the whare. These mate (the deceased) had been actively involved with Te Kāinga. The programme included a formal pōwhiri (welcome), a Miha (Mass), and a hākari (feast) at the conclusion of the Raa (day). Many helped to make this day a memorable time for whānau to gather together and share stories of their loved ones.